Both Obama and Modi have taken bold steps towards laying the groundwork to give a big push to Indo-US trade, and now it's time to execute, says Bikash Mohapatra. The last few years, Indo-US commercial relationship have witnessed a positive change. Both President Barack Obama, in his second tenure, and Prime Minister Narendra Modi, in his first term, have made attempts to forge deeper partnership between the communities, businesses and economies of the two nations. To their credit both leaders have been fully committed to building a revitalised 21st century framework for commercial cooperation. In 2013, shortly after assuming office for a second time, US Vice President Joe Biden delivered a memorable speech at the Bombay Stock Exchange, recognising that bilateral trade between the United States and India had increased five folds, between 2000 and 2013. “Why can’t we grow five-fold once more?” he asked. If the answer to his question is mentioned in numbers it would amount to $500 billion. 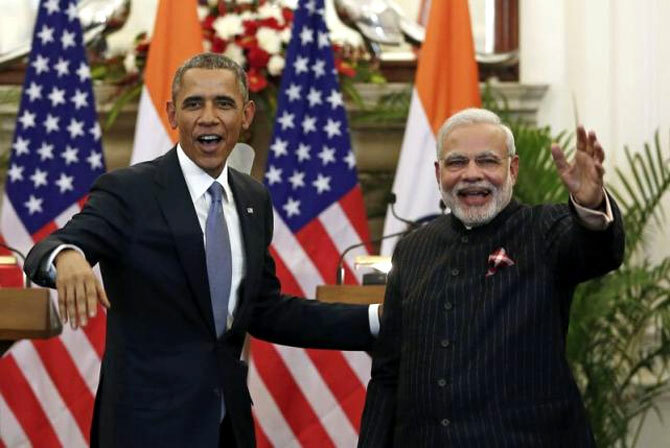 Likewise, in January 2015, Obama and Modi advanced their vision by launching the first ever US - India Strategic and Commercial Dialogue (S&CD). The US Secretary of State John Kerry and Commerce Secretary Ben Pritzker, along with their Indian counterparts, chaired the inaugural meeting in Washington, DC, last September. The benefits of success are clear and compelling for both the United States and India. In particular, it is a shot in the arm for Modi’s much publicised Make in India initiative. US companies have unique capabilities that can address India's priority needs, and help meet many of Modi’s economic development priorities like e-commerce, tourism, defence and clean energy. As Obama’s final tenure nears it ends, and that of Modi’s nears the halfway stage, the two leaders are meeting once again to take their vision forward. However, there’s one question that begs for an answer. What happens when Obama’s term ends? If Arun Kumar, US Assistant Secretary of Commerce is to be believed, things are on the right track. “In the context of this meeting the important question is what is going to happen to the US - India commercial engagement. We are working very hard to institutionalise things so that, irrespective of the political leadership, the mechanism, structure and the momentum will be there to continue,” he explained, before proceeding to elaborate on his point. “Let me point specifically to two areas. One is the CEO Forum. We have integrated that into the (S&CD). "The CEOs jointly came up with 10 recommendations and that happen to be part of the work stream for the S&CD. So we have these mutual reinforcement mechanism where the CEO Forum informs the S&CD and we, in turn, quicken the proceedings in the government way. While things have moved in a positive direction, in recent years, the proverbial speed breakers continue to exist. Question mark remains as regards the ease of doing business in India, where high tariffs, localisation requirements and other trade barriers and policies continue to be a challenge. Overall, US exports to India face an average tax on the border of more than 30 per cent that is over six times the US duties levied on Indian goods. “To enhance its position in the global supply chain, and to deepen its integration into the world economy, India will need to harmonise product standards with international rules,” observed Kumar. The issue is fundamental to the future growth trajectory of India’s commercial relationship with the US, and as Modi realises, to India’s overall economic future. As such there’s been some improvement. Many US companies are increasingly optimistic about the shift in the official tone and increased willingness to engage from New Delhi, but are waiting to see further tangible progress in the Indian business climate. “There has been a noteworthy cooperation between the two countries in this area. Arguably the most important S&CD focus was on making it easier for our companies to work in each other’s countries,” he added. Ashok Wadhwa, Group Chief Executive Officer of Ambit Holdings Private Limited, concurred. “There’s no doubt there’s a certain commitment about changing the archaic rules and regulations. But we all know that commitment is necessary but not adequate. The passage of India’s first National Bankruptcy Law is being seen as a significant milestone. It makes it more likely for the Indian banks to recoup their investments and therefore, lend to promising Indian entrepreneurs in the future. Building on this momentum we are planning to hold a first ever, private sector led, US - India Innovation Forum, to exchange ideas and share best practices. The other important issues relate to the visa restrictions imposed by the US and policies to protect Intellectual Property Rights (IPRs), that are essential to support innovation. Earlier this year Modi presided over the launch of Start Up India, and he would be keen to take one of his pet projects a step ahead. The US Assistant Secretary of Commerce doesn’t see any impediment in this regard. "Many American technology start-ups - from the Silcon Valley, Boston and New York, at a very early stage, set up an operation somewhere in India, be it in Bangalore, Hyderabad or Mumbai. So that is already happening,” explained Kumar. “The other interesting aspect would be Indian companies/entrepreneurs, who start-up here and are interested in the global market, would like to come to the Silicon Valley and create a platform for global expansion. “We are encouraging that in a big way, helping entrepreneurial companies come and scale up in the US,” he added. “There are a lot of Indian owners and entrepreneurs in the midcap segment who are spending considerable amount of the time on the West Coast, just understanding and talking to companies in that space,” added Wadhwa. In his final tenure, Obama has taken significant strides when in comes to strengthening trade relations. In the last year alone, the landmark Trans-Pacific Partnership (TPP) – that includes countries that comprise 40 per cent of the world’s GDP – was signed. The United States is also making significant progress towards a similarly groundbreaking trade liberalisation agreement with Europe. As regards India, both Obama and Modi have taken bold steps towards laying the groundwork for success. Now is the time to execute.